Cajan winning best of breed and puppy in group. Titles: Canadian championship, American championship. Health: Hips good, thyroid normal. About Cajan . 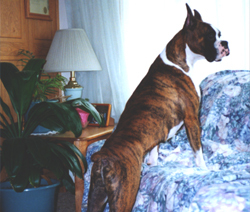 . .
Cajan was our first homebred American / Canadian champion. He was shown in the states by Linda Huffman. Cajan loved to attack snow shovels and water hoses, and retrieve frisbees. His mission in life was to kill the squeaky in any and all toys and his favourite toy in the whole world was an empty plastic pop bottle. Cajan was a gentle soul that would much rather snuggle with you than show himself off in a show ring. Cajan’s show career . . .
Cajan's debut to the world of showing was at the age of five months when he won a fun match. Then, just before his six month birthday, Cajan entered a sanction match and won best in breed, best in group, best puppy in match and best in match. 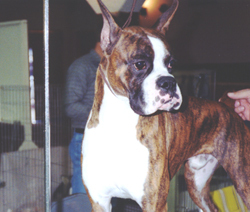 In March 1994, Cajan obtained his Canadian championship as a puppy. 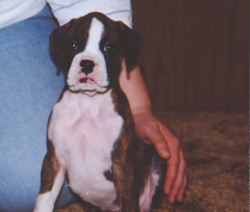 In May 1994, Cajan won puppy in group and best of breed at the Saskatchewan Working and Herding Dog Specialty. He was shown by Hugh Middleditch from Alberta. In July 1995, Cajan obtained his American championship. Cajan at various stages in his life . . .
Cajan as a young adult. Cajan looking out the window.